Riding your ATV is an exciting experience but it can be frustrating when its battery dies. Your ATV’s battery can die when it has been sitting for a while. Unlike your car that you drive every day, the battery of your ATV will die when you don’t drive it often. You must smack the battery alive so it continues to serve you for many years. However, it is important to keep in mind that just merely riding your cote à cote usagé en bon état or ATV for a while won’t charge the battery. An ATV uses a stator which maintains a charge to power whatever is currently running. Your car uses an alternator that charges the battery while running. So how exactly can you revive a dead ATV battery? This involves tricking the ATV into starting. You will have to get the wheels moving to trick the engine into rolling over. When it is on, it will charge the battery when you drive. You can do this by turning on the switch or keys and putting the vehicle into first gear. In some cases, you may have to put it into second gear. After this, pull the up the clutch and get the vehicle rolling to 10 mph. Let out the clutch and add gas when you hear the engine trying to turn. You will perform this like when you are jumping your ATV like when you jump your car. Start by connecting the cables to the good battery and connecting the bad battery. Start the good battery first and allow it idle for a few minutes. 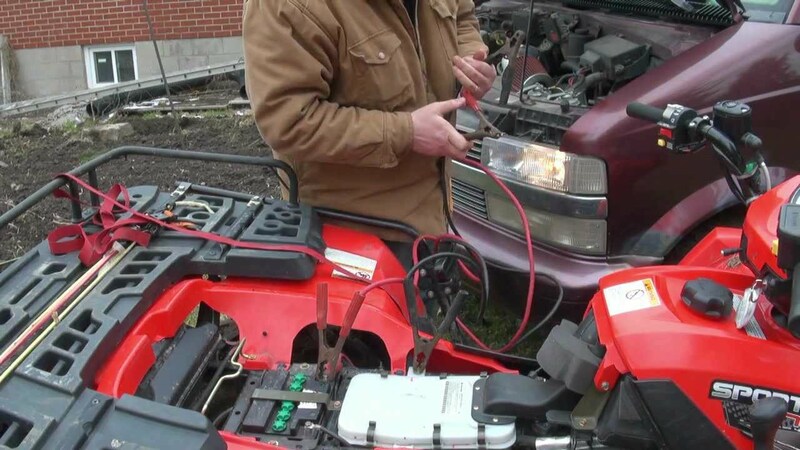 After this, start the bad battery and when it starts, remove the red wire, then the black from the newly started ATV. This process should be repeated for the other. This is just like jumping the ATV from another ATV except that the battery and charging system of the car is stronger than that of an ATV. Because of this, you should not start the engine on the car when you jump-start an ATV. The car’s battery should have enough juice to start the ATV motor without the engine of the car running. Every time you work with anything which carries electricity, make sure you wear rubber sole shoes. Also, be extra careful where to touch by staying away from the battery’s positive terminal.